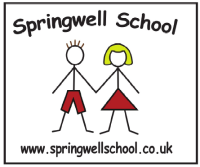 Springwell School is a special school for children with a broad range of needs including moderate, severe, profound and multiple learning difficulties, Autistic spectrum disorders (ASD) and Social, emotional and mental health difficulties (SEMH). There are 71 places for children aged between 3 and 11 years of age who are predominantly from the Hartlepool area. We want all children to enjoy school and to be supported to achieve their very best. We are committed to giving all our children every opportunity to achieve and make progress from their varied starting points. We offer excellent educational opportunities which are second to none. We have specific resources including our own soft play area with a large ball pool, hydrotherapy pool, two sensory rooms, computer suite, iPads, Eye Gaze PC’s and interactive boards in the classrooms, Each classroom is spacious and offers a stimulating context for learning with breakout and outdoor areas.